Useful Utilities is a series where Mr Epidemiology outlines software he finds helpful and feels that students would benefit from knowing. Today, he’ll be talking about Dropbox, a free cloud based file storage system. For those who already have a Dropbox account, read on as there are tips at the end for gaining free Dropbox space after the jump. Allow me to paint a picture for you. Mr Epidemiology wasn’t yet an Epidemiologist. He was a little undergrad, excited to be doing an honors thesis, where he studied caterpillars. He worked hard, and towards the end of his undergraduate thesis, he backed everything onto a USB key. To ensure that he wouldn’t misplace or lose it, he put the USB key onto his key chain with his car keys. Since he drove everywhere, he would never lose it. But, Fate had a terrible … fate … in store for him (Note: get a thesaurus). He went to see The Trews perform at an outdoor concert. It poured down for almost 3 hours, yet the band played on. He had a great time. He was soaked through, but thoroughly enjoyed the show. 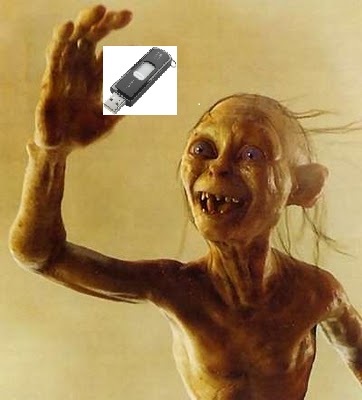 But when he got home, he realized that the rain had fried his USB key. And along with it, all the work he had done. Luckily, he had a backup on his computer, but if not for that, he would have been in a lot of trouble. Dropbox works like a USB drive on the internet. It shows up as a folder on your computer, and when you drop a file in there, it uploads to the Dropbox servers, and you can access it from anywhere. When you then log onto your next machine, it will sync all the files with the Dropbox server so you have the most recent copy of all your files in your Dropbox folder. I find it particularly useful since I have a desktop, a laptop and a work computer. There are also iPhone, Android, Blackberry and iPad apps available (https://www.dropbox.com/anywhere). The key benefits are that you can’t lose it (since everything is stored online), and the level of redundancy built into it. Working on your laptop without internet access? Not a problem. 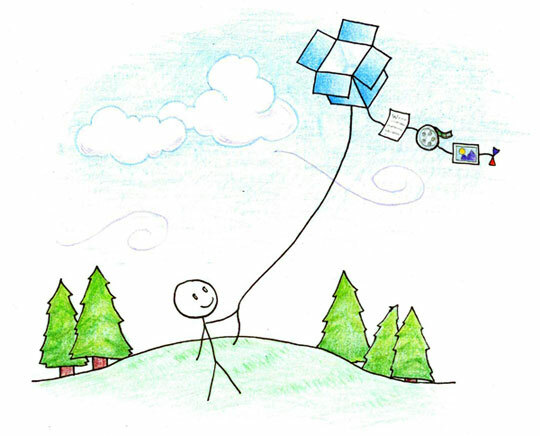 As soon as you have internet access again, Dropbox will sync with the cloud and upload your files. Delete a file by mistake? Dropbox keeps deleted files so you can restore an old one. Save over a file? Dropbox keeps copies of old files so you can go back to a previous version. If you’re working on a machine without Dropbox, you can log into your Dropbox account, download the file, and upload the edited file when you’re done. Then, when you get back to your regular computer, it’ll sync into your Dropbox folder. Considerably easier than constantly emailing files to yourself! All your files are at your fingertips! You get 2 GB for free when you sign up. You can pay for more space (50GB for $99, 100 GB for $199), but I find the 2GB is more than enough. If you use this link though: http://db.tt/aQFyR3c you will get an extra 250 MB (as will I for referring you). In addition to that, you can also get more space by using a few simple tricks. As mentioned above, you get 250 MB for each referral. But, you can also gain space by completing the tasks outlined by Lifehacker here. These include: adding your University email to your account to get 500MB per referral (it says .edu, but I used my @Queensu email and it worked fine) and helping to spread the word through Facebook and Twitter. I find Dropbox to be invaluable for the work that I do. Dropbox is password protected, pretty secure, and works across Macs/PCs. However, security is a major concern. I wouldn’t advise putting anything too sensitive on there (birth certificates, social insurance numbers etc). For files like manuscripts/thesis documents it works great. Like anything online, it’s not 100% secure. However, I don’t view that as being any less safe than having a USB key that could be lost/stolen. And really, I don’t know many people that would benefit from my old manuscripts and thesis drafts. If you want, you can encrypt files before uploading them, but that isn’t something Dropbox natively supports (i.e. you’ll have to encrypt it yourself). Do you use Dropbox? What do you think? Did you find it useful or not so much? Let me know in the comments! Disclaimer: I am not being paid by Dropbox, and I am not receiving anything from them. However, if they want to send me a t-shirt, that would be cool. Great post! Dropbox is a lifesaver for me. Not only do I use it religiously on my laptop, iPad, and iPhone, but it’s also a quick-and-easy way to access any mission-critical documents I need on-the-go, such as on a friend’s computer (being security-conscious, of course, to not save my password, log out once I’m done, and so forth). If you also find yourself sharing a lot of documents and files, you can create a shared Dropbox folder that others can access. This has been useful for a multitude of applications, from collaborative productivity on documents/slideshows to just sharing photos with people without having to manually upload them all. Shared folders count toward your storage limit, though, so keep that in mind when you accept share requests from others. You can always remove yourself from a shared folder if you want to. On the security front, it bears mentioning that Dropbox had a recent fiasco where anyone was able to access any account using any password. They fixed this as soon as they learned about it, but as Mr. Epidemiology said: be very careful about what you put out there on “the cloud”. It might feel like it’s safe and secure because you’re moving files onto what seems like a folder on your local machine, but it’s out there on the Internet – and people can access anything that’s out there if they try hard enough, regardless of how much security you put on it. When my laptop was starting to show signs of dying, I upped my Dropbox usage. Now, my important/active folders are all in my Dropbox folder so that they auto-update every time I save. I’m no longer afraid of losing all my work or compulsively backing everything up weekly. (NOTE: I still back up before a trip or after about a month or so). It reduces stress and allows me to get my work done worry-free. Go Dropbox go! I found Dropbox to be a lifesaver. It definitely increases my total productivity. It is not always allowed in all settings but I do not think I will ever do without it again if it is possible. I find Dropbox interesting and helpful, especially when sharing information. My wife uses Google Docs for her own activities. We like it that it can extend our data storage virtually or into a cloud and we can bring it anywhere. The only problem is having an internet connection, which may be a challenge if you don’t have one.